What is Shadow Quality and Why Does it Matter? If you’ve read LNS’s Monday Musings providing our perspective on current events in industry, you’ve likely seen the term “shadow quality” in this blog post. So, just what is shadow quality? It’s a term we’ve coined that borrows from term “shadow IT.” Shadow IT is the use of informal, homegrown, or otherwise unapproved IT systems that are deployed throughout organizations often by individuals or groups. Shadow IT grew out of necessity to fill gaps in the IT landscape, but these necessary stopgaps have become a permanent and debilitating crutch. While a CIOs shadow-y nightmares are filled with unapproved use of Cloud-based apps that create security risks and eat IT budget, a CQO or VP of Quality should be worried about something a lot more terrestrial. The bane of quality data management are the email, spreadsheets and homegrown departmental solutions. There are cloud-based systems too, but the quality management landscape has been fragmented before fragmentation got cool buzzwords like shadow IT or the cloud existed. Think of all the separate systems across functions to track quality issues, separate QMS systems by BU, and wide spread adoption of spreadsheets and email used to get around system limitations. Sure, the job gets done, but its invisible to the enterprise. Much of the cost of good quality is hidden by shadow quality, as is quite a bit of the cost of poor quality – again, back to fragmented systems recording issues. Better hope that nobody leaves because when IT wipes that hard drive years of quality data are lost! 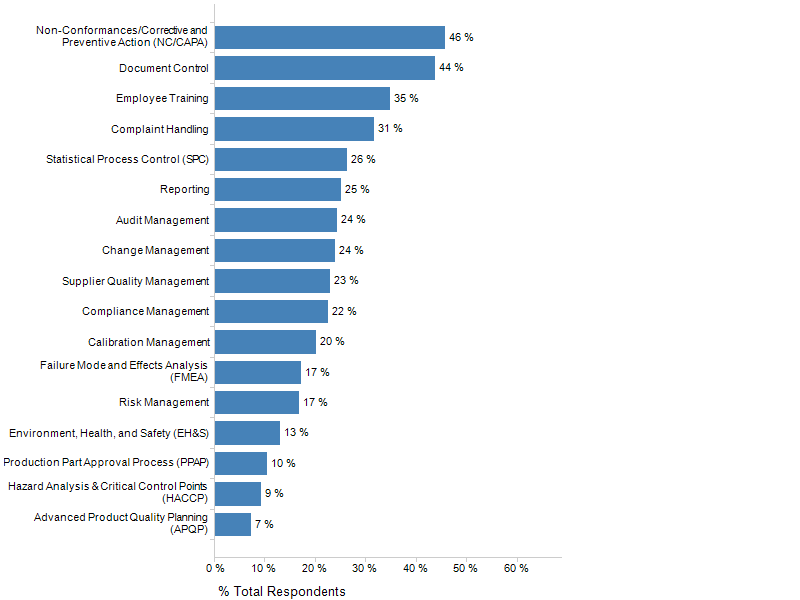 Previous posts have identified that the top quality management challenge is disparate systems and data sources (38% of respondents). This is shadow quality. As an example, would you agree that quality, sourcing, operations, finance and others should all interact in some way with supplier quality management (SQM) processes and data? Would it surprise you that only 23% of companies automate SQM? How about that this puts SQM at the median and that the most automated process – NC/CAPA – is only automated by 46% of respondents? Figure 1. Which Quality Processes does your company automate with software? On our March 15th LNS Quality Global Executive Council call, Michael Bennett of Nexteer Automotive described its move from a fragmented SQM approach to an integrated enterprise platform. Nexteer’s old approach – mostly spreadsheets and email - created confusion, loss of data, loss of access to data, siloed information, etc. Nexteer recognized this problem and fixed it by deploying a centralized SQM system on a single platform, providing both suppliers and Nexteer personnel with a single portal, and single look and feel. Michael validated that this new system enabled integrated and automated processes, cross-functional engagement, and data-driven decision-making. It also has quickly ramped up in usage, and received positive feedback from three critical system customers: internal users, supplier users, and auditors. Michael points to Nexteer’s audit success as one telling endorsement of the new approach. Nexteer now has wide-spread internal and external adoption, process participation, and governance. Personnel are actively using the process in an approved and enforceable manner, with monitoring and management oversight. Therefore, audits are simple – just look in the system and you can find what you need without preparation, just like you’d find in other core processes like ERP or PLM. The latest audits were completed with zero findings and observations, indicating a very healthy process. Like it or not, Operational Excellence is a three-legged stool of people, process and technology, and each of the legs is important. Technology is not an answer in and of itself, but an organization must honestly assess the importance of each leg of the stool to the success of the other two. How are processes really being accomplished? If they were automated, how could that automation make the process better? How would the automated and enhanced process increase adoption? How would increased adoption improve culture and quality thinking across departments? We, the quality community, are being asked to take a fresh role in organizations and participate in new ways. To help lead quality efforts, rather than police them. If we are to do that, we need to quit thinking like individual contributors and hall monitors, and rather think like the cross-enterprise leaders that we need to be. The expertise is there – how will you share it? Join us on Tuesday, March 29, at 1:00 pm EDT as Andrew Hughes present the results from the fourth iteration of the Metrics that Matter research study conducted between LNS Research and MESA International, and places particular focus on how the deployment of IIoT, Cloud, and Analytics are transforming manufacturing today.